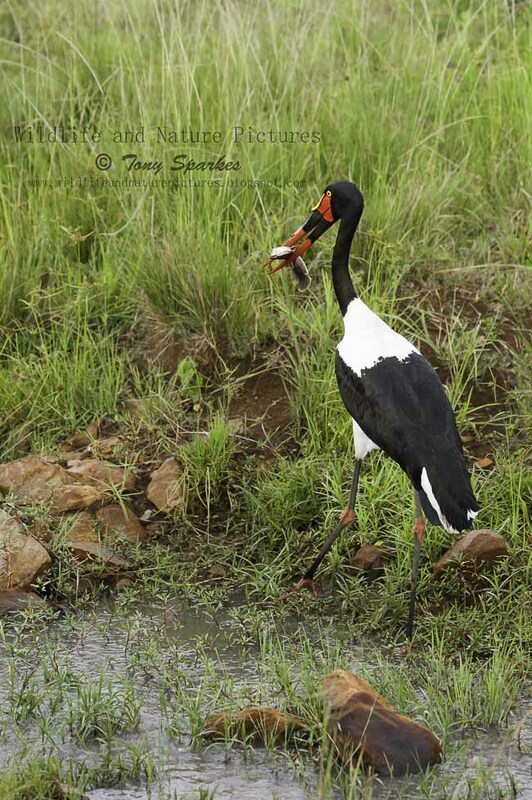 Taken on a recent trip to the Kruger National Park, I came across this female (you can tell by the yellow eye iris, males iris's are black and have smallish yellow wattles) Saddled Billed Stork (Ephippiorhynchus senegalensis) fishing in a small stream. I sat there amazed as I watched this stork probably the world's tallest stork coming in at a staggering 150 cm (59 in), in height, a length of 142 cm (56 in) and a 2.4–2.7 m (7.9–8.9 ft) wingspan. They are silent except for bill-clattering at the nest. Like most storks, these fly with the neck outstretched, not retracted like a heron in flight.